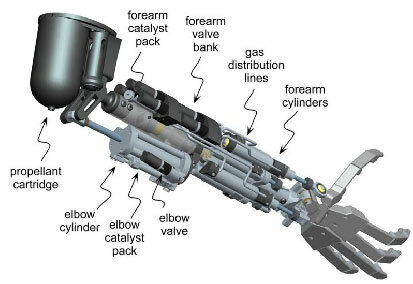 A radical hydrogen-peroxide-based power source gives Vanderbilt University's prosthetic limb its quickness and power. However, it offers a great advantage over current actuators for prosthetic limbs that would actually fit into a human-arm sized limb. The power unit provides about ten times as much power as other prosthetic limbs, according to Michael Goldfarm, professor of mechanical engineering at VU. Goldfarb’s power source is about the size of a pencil and contains a special catalyst that causes hydrogen peroxide to burn. When this compound burns, it produces pure steam. The steam is used to open and close a series of valves. The valves are connected to the spring-loaded joints of the prosthesis by belts made of a special monofilament used in appliance handles and aircraft parts. A small sealed canister of hydrogen peroxide that easily fits in the upper arm can provide enough energy to power the device for 18 hours of normal activity. The end result is a prosthetic limb that is both quick enough and strong enough to throw a ball, as well as many other such tasks. This device could be tested in humans as early as 2009, which will be good news for Iraq war veterans, who as a group have a greater need for prosthetics than veterans of previous wars. The prosthetic device will also give off steam as a byproduct of use, so it would be the first prosthetic device to actually "sweat" like a person's normal arm, with the right kind of plastic covering. This new design will bring science-fictional devices like bionic arms and exoskeletons into being sooner than expected. Read more at Vanderbilt University.